Protecting yourself against bike theft can be one of the most challenging things as a cyclist. The opportunities thieves have to part you with your friend whether that be while you are grabbing a coffee at the cafe stop to thieves dressed as cyclists at sportives. 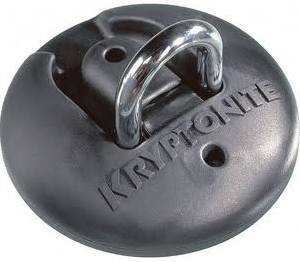 There is one area that you can protect though and really you have no excuse not to and that is your home, so when I received an email from Tesco Compare last week asking me to review a Kryptonite Stronghold Anchor I jumped at the opportunity. 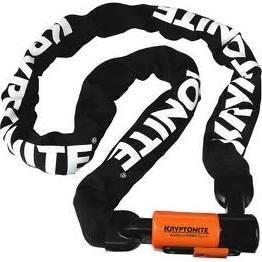 The first thing I should mention is the weight of the Kryptonite stronghold anchor. I came home from a quick morning spin on the road bike to find my poor postman cycling up the hill with it in his bag. Needless to say he was happy to see me arrive as he posted the recorded delivery slip through the door, safe in the knowledge he did not have to carry it for the full round. This device is certainly sturdy. Do you have a big drill? Because you are going to need one. 3 5/8″ holes need to be drilled into concrete. This is a good thing as you don’t want this piece of kit moving anywhere. The kit comes with all the drill bits you need and for that matter the allen keys too. Once you have the holes drilled it is pretty straight forward to fit. The kit is supplied with 3 anchor bolts that fit the unit very securely. Make sure you remove any residual dust from the holes before you hammer these in though. If you don’t you will have an anchor that is not flush with the wall / floor and it will be easy for a thief to prize it off. The kit comes with 3 ball bearings and caps to go over the bolts. This stops the thief from just drilling out the bolts so it is important to fit them. What’s in the stand: The Yeti. Time for an Avid Elixir lever overhaul!